HP IP Bearing Support Assembly and Trolley Design. Acres have modified an existing support assembly to accommodate the HP IP Lifting bars. New Vee blocks have been fitted to locate a 30mm diameter shaft of the lifting bars, these have been set 100mm high off the top rail of the frame. The castors have also been removed and replaced with 100mm wide x 10mm thick flat plate rails to enable it to run on the trolley and oven roller beds. The trolley will carry the HP IP Bearing Support Assembly, this will enable the operator to easily push the Front Bearing Housing from the trolley into the oven. 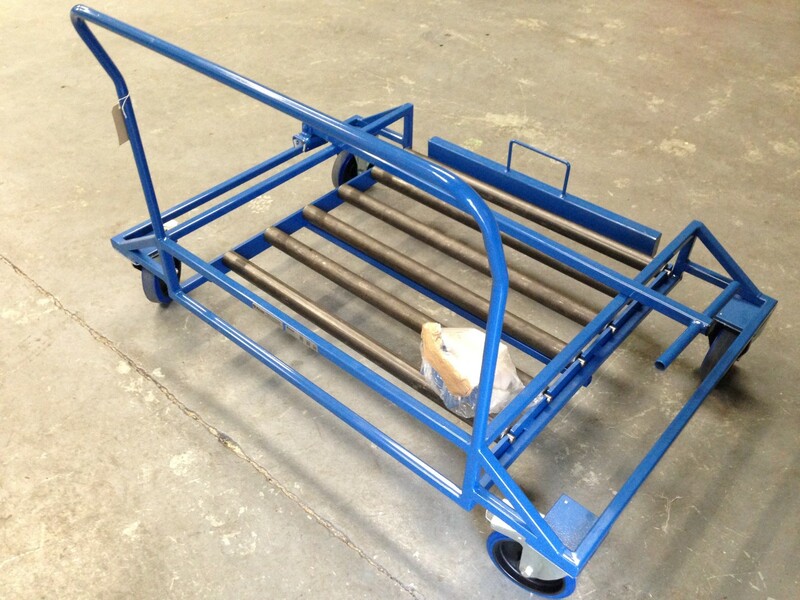 The roller bed features 48mm diameter rollers with fitted ball bearings mounted to the trolley. To manoeuvre the trolley it has been fitted with 200mm diameter castors, 2 off swivel with brakes and 2 off fixed with blue tyred nylon centred wheels. The castors will be mounted on outriggers so the wheel size can be kept at 200mm while still keeping the low roller bed height. The trolley has been powder coat finished in BS 4800 20-D-45 Blue. Approximate overall size – 1000mm (L) x 1350mm (W) x 1100mm (H). The roller bed height will be 260mm to match the oven roller bed. The trolley and assembly have been load tested to 250kg SWL.